Put an egg on that! Lately I've been fairly obsessed with Willow Moon Farm's Ginger-Lemon Chevre; I just can't get enough of its bright, sunny flavor. Creamy and rich, it's a light, spreadable cheese that's as good on a cracker as it is in a salad. And it's a perfect foil against the intense bitterness of radicchio in a warm, not-so-springy salad. 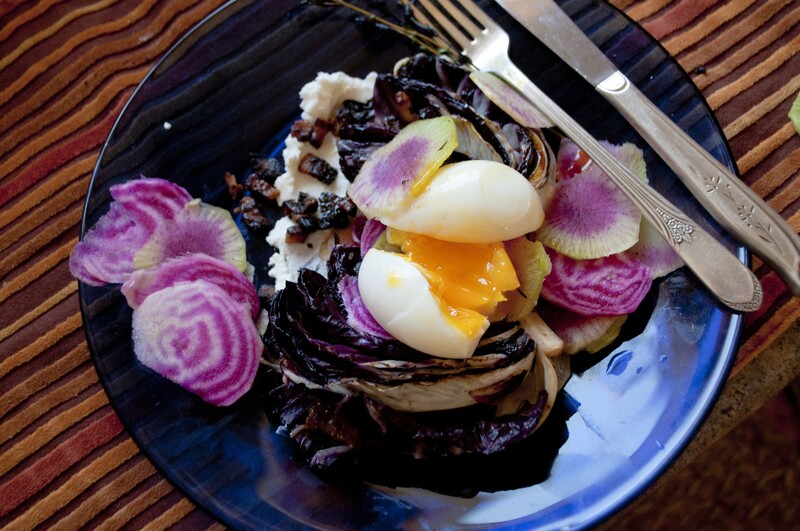 If radicchio is too bitter for your palate, use endive instead. So, in the spirit of warmer weather, here's a pretty, slightly fancy, but very easy (non-recipe) dish. It could work as a starter, but I've been digging it as a light lunch. Since it's still root-cellar season, I added some shaved chioggia beets and watermelon radishes from Jericho Settlers Farm, which are have been holding strong in my pantry for weeks. The beets are sweet and earthy; the radishes sharp and toothy. And (because why not? ), I added a bit of maple-candied guanciale — bacon or pancetta will work — and a soft-boiled egg from a friend's farm. Prepare the eggs first. If you don't know how to soft-boil an egg, fear not. Boil enough water to completely submerge the eggs. When it's rolling, add the eggs and cook for SIX MINUTES. Drain the water from the pan, leaving the eggs inside, and submerge them in cold water so they don't keep cooking inside their shells. When you're ready to assemble the dish, carefully peel the eggs. Brown the pork until crisp. Remove from heat and drain the fat. While the pan is still very hot, add a generous splash of maple syrup and stir until all the pork is coated. Leave in the hot pan to cool. Shave the beets and radish. Heat the coconut oil in large skillet over high heat. Add the smashed garlic and thyme and swirl these around so the oil picks up their scent. Add half of the shaved beets and radishes. Season the radicchio quarters with salt and pepper and place face-down in the hot skillet. Sear for 2-3 minutes on each side, applying pressure with a spatula or weight, until they are nicely browned on the surface and begin to release their moisture. Now it's ready to assemble the salad. Smear a nice dollop of chevre onto a plate; scatter a few of the warmed beet and radishes in the middle, so it's kind of like a nest. Arrange two of the radicchio quarters on top of the warm roots. Keep them close together so they're touching, as you'll want to put the egg on top of/between them. Place one of the peeled eggs on top. Scatter with the uncooked radishes and beets and the candied bacon, and serve immediately: a 20-minute meal never looked so impressive! 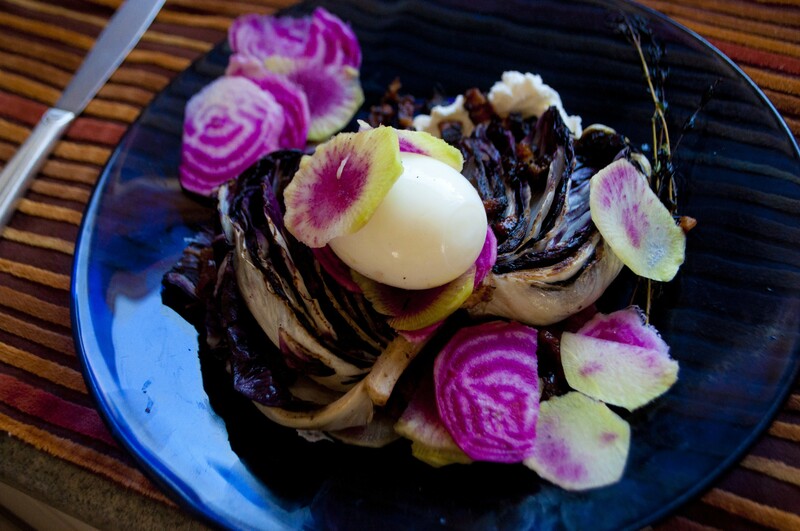 When shaved, chioggia beets and watermelon radishes look like flower petals.